My Rick is a painter. He’s also a poet, a cartoonist, and a lover of the “wild west” of his imagination. He’s read every Larry McMurtrey novel ever written. Ditto for every Elmore Leonard western. Double-ditto for Cormac McCarthy. Half a ditto for A. B. Guthrie, Jr.
Maybe that vein of wild-west yeehaw! is merely resonating with his artist/philosopher/cartoonist self. 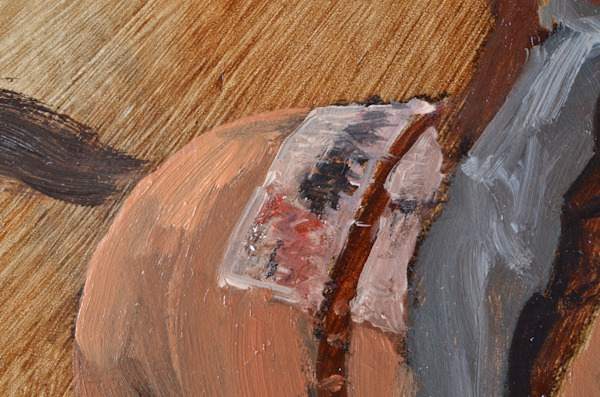 Nobody else paints like this. In one horse’s head, you can see just a handful of the many Ricks that live in those curly white locks. There’s Rick, the grade-school daydream doodler… sketcher of form. 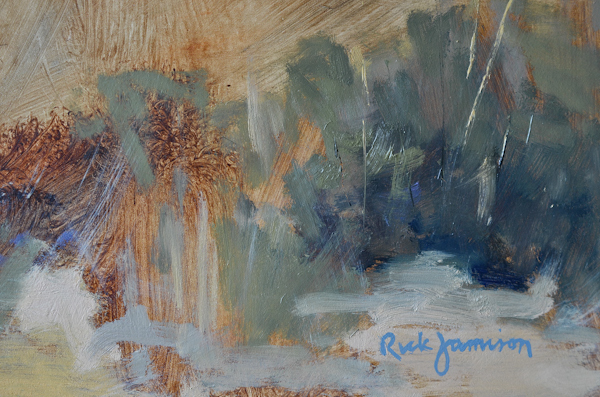 There’s Rick, the confident manipulator of texture and stroke and chroma, whose seemingly effortless precision with a flick of white highlight captures the soft orb of a horse’s eye with such gentleness and love… That one is where Rick, the student of art for five decades, meets Rick, the complete mushpot lover of animals. 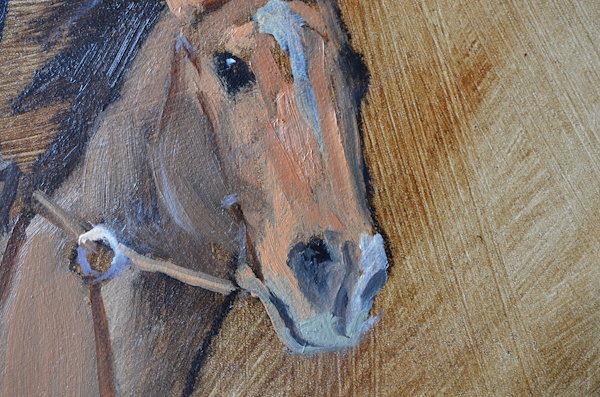 And who uses the color and contour of the underpainting to craft a believable shading of a horse’s neck? That seems to be one of his own personal magic tricks: knowing when leaving something out—a “helpful” comment, a glance at my ridiculous morning hair, paint—can make a moment more, not less. There’s Rick, the cartoonist, who believes people can be trusted to fill in the lines for themselves. 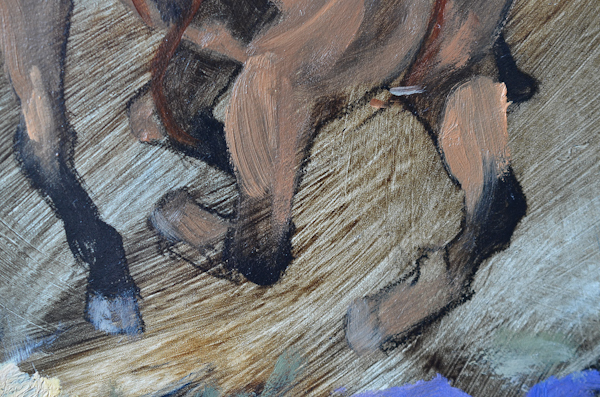 It takes a man confident in his inner ‘toonist to pull off a painting technique that allows a galloping horse to escape gravity. 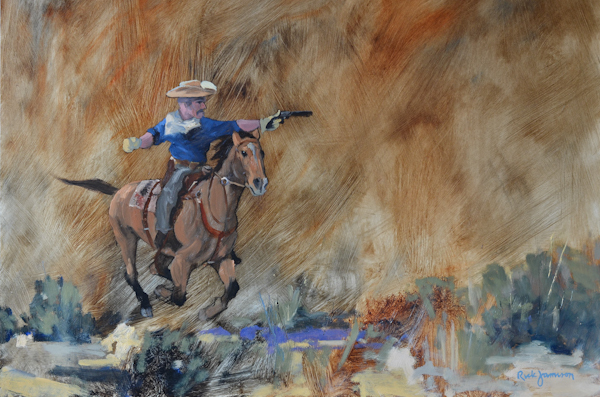 Good guys wear white… unless it’s just a smarty-pants perfect highlighting of the dang hat, and using the tumultuous underpainting stroke direction to indicate both believable arm muscle flex and cloth folds, accurate at a gallop. I’ve stopped asking, because I believe it now. … and how six apparently random skinny white lines above his signature that looks like part of the painting would move the whole thing to “the wild west” in my imagination. That is one beautiful painting. Thanks for sharing it with me. Hey Liv! So nice to see you here. 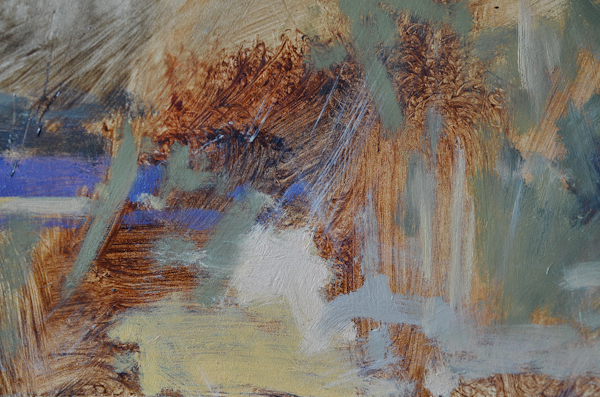 I’ve tried to send you a couple of emails but they bounce back… would love to catch up! I’ll try again. What a beautiful visual to wake up to…..Thank you! 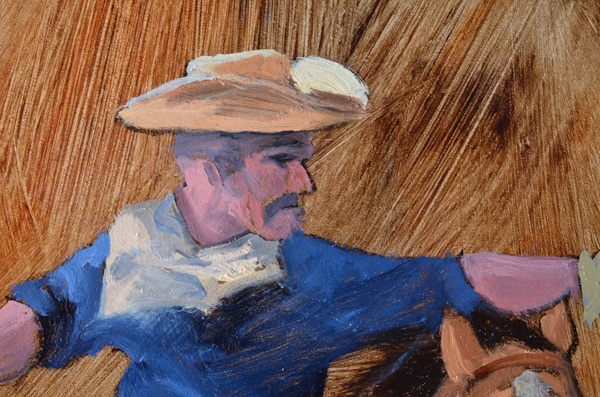 Watch out Frederic Remington is riding up behind you! Thanks, Sue. Can’t wait to see you guys! Nancy! Thanks for your sweet comment and recommendations. Will definitely look into Willa!